Feeling the fall chill in the air? Wrap up in this beautiful Terry Peacoat from Shade Clothing! I was recently given the opportunity to review Shade's Terry Peacoat in Off White/Heather Oatmeal. There are two things I absolutely love about this jacket: it's cozy, and it's just the right weight that I can wear it as a jacket (outside) or as a blazer/sweater (inside) this time of year. And it goes with everything! It's something I can wear to work and come home and just hang out in - no need to change! :) This jacket is made of a super soft cotton/modal blend - and it's fully lined - so you know it's well made. I love that the high collar & buttons keep it classy & refined, but the fabric keeps it very laid back- very comfortable & wearable - even a little sporty! I love that Shade's clothing is so simple and refined. They also have some really great girly details (love the bow neck on this Pintuck top and the longer length) and the draping of this cardigan (and the color!) is so beautiful and timeless. Shade also has a really great style guide feature on their website where they show different ways to wear Skirts! Awesome! As a frugal gal, I love love love finding unique ways to spruce up my wardrobe with things I already have. Check it out for some ways to rev up your wardrobe! Want to win your own? One lucky Frugal & Fabulous reader will win their own Terry Peacoat from Shade Clothing! *Your favorite item from the Shade Clothing web site! 1. Follow me on blogger! You have until Thursday, Nov 5 @ 9pm EST to enter! (Winner must respond within 48 hours.) Giveaway open to U.S. residents only. PS: Are you one of Shade's Biggest Fans? Shade is currently holding a contest to find their 5 biggest fans! Enter any way you like - send them your photos, videos by Friday October 30! and my favorite item on their website is the Geo Print Tunic. :) I love tunics. And there website is great! I liked the box pleated top. :) I just started following your blog and it's great! I follow your feed through MyYahoo. Thanks! I love the pea coat it's adorable but next to that the V-Neck Placket Top is very cute also. i'm liking that denim skirt. plain and practical! I really like the 3/4 Sleeve V Neck Cardigan! I like the 3/4 sleeve v neck cardigan! i love the cowl neck long sleeve shirt! I love the jacket you're giving away most but besides that- the draped cardigan is GORGEOUS. I subscribe to your blog in my feed reader! I loooove that draped cardigan sweater! Our winters aren't that cold and it would be a perfect! so cute! My favorite item is the lounge pants with band. Look super comfy! fan of yours on facebook. fan of shade clothing on facebook. My favorite item is the drape front cardigan-i love how versatile is. You could layer it over a t-shirt with skinny jeans and boots for a comfortable weekend look, or add a cute belt and a collared shirt for a work look. I also subscribe to your blog through Google Reader. I love the Plaid Tunic. I love the Waffle Henly. Very cute. Thanks for the giveaway! I subscribe to your blog. Thanks! I entered your watch giveaway. I am a Facebook Fan of Frugal. I am madly in love with the box pleat top and the plaid skirt. Okay, fine. I love all things Shade!! And my fav item is their basics for sure! I entered to win a watch too! I have been a follower for some time. This is my first time entering any contest but I couldn’t pass this one down. Love the Terry Peacoat. With a one year old, don’t know if it would stay white for long. Email address is gloriaregalado@hotmail.com. and My favorite item on their website is the terry peacoat!!! I love the box pleated top too! I love the turtleneck dress. I like the shirt dress! My favorite item in the Terry Peacoat! I hope I win, I really need a new coat for school! I follow shade on FB! My name is Amy and email is amymriley@gmail.com. Favorite shade item is their new denim skirt. So cute and would love this jacket. my favorite well besides their wonderful basics would have to be currently the denim skirt. I just started to follow your blog. Love it! I love the denim skirt! and I just love the Turtleneck Dress. 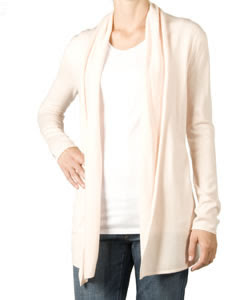 Favorite Shade: Drape front cardigan -- perfect for fall! I am a fan of Shade on facebook! I am a fan of Frugal and Fabulous on facebook! I just added your button to my blog! My favorite item would have to be the 3/4 length sleeve maternity cardigan (for my Daughter-in-law that is having my 2nd Grandchild in the Spring :) (And I just love the drape-front cardigan as well!!! Very pretty and adaptable! I also entered the inexpensive watch giveaway! I'm also a brand-new E-Mail subscriber, as of tonight! I posted about the giveaway on my blog! #2) Brand new E-Mail subscriber, thanks for the extra entry!!! #2 I posted about the giveaway on my blog! My favorite item is the drape front cardigan. I also love their basics. I subscribed through My Yahoo! i love the plaid tunic, the long cardi and the turtleneck dress. My favorite item has always been the basic cap sleeve. Goes with anything for any occasion. I love the terry peacoat and the interlock dress (which is sold out). Also a huge fan of the cap sleeves! I love the cowl neck shirt! The layer tees are my favorite! they go with everything! my favorite item from shade is their drape front cardigan! Own it and Love it! I love the draped front cardigin!!! Follow both you and shade on twitter! My very favorite is the V-Neck Placket Top. I Love it in both the grey and the Navy. It is SO dang CUTE!!! I Love your Blog! I love the V-Neck Placket Top. It is SO cute and I love it in both colors- the grey and the navy. I Love your blog! My favorite is the floral skirt. I am a new follower! love your blog! I can't live without Shade's Camis! I love the Ruffle Empire dress. I love love love Shade's Lounge pants!!! Became a fan of Frugal & Fabulous on facebook. I love all the sweaters at Shade this season, but my favorite is probably the Drape Front Cardigan. I like it in Heather Black. I subscribe to your blog through email! #2 I am a new subscriber through email! I entered the inexpensivewatches giveaway. I love Shade's layering basics! Hope I win! I love the layering basic tees. The pea coat is so cute. Call me boring, but I am a fan of the layer tee. I buy them every season and LOVE them! I love everything about Shade clothing! I love the way they layer and use cami's! I haven't seen this pea coat, but instantly fell in love with it while reading your review! love the coat!! and i love their lounge pant with a band. thanks for the giveaway!! Love their cowl neck shirt! My favorite is the drape front cardigan. I really like the pintuck bow top. I think it is adorable. Perfect for fall or spring! my favorite think on the shade website are the high waist skirts and the drap front cardigan. I love shade! So hard to choose! I really love the drape front cardigan. It is so versatile. oooh and the pintuck bow top. I love the Terry Peacoat and the Long Sleeve Oxford and everything else from Shade! Love it! It's actually my favorite thing there right now! I'm following both on twitter. I'm a fan of both on facebook! And last but certainly not least I love the drape front cardigan or the layer tees. Everyone needs to own some of them. They are the most comfortable things! !